Should I be interested in a top 100 list I'm not on? Of course I should. Here's a list of developer blogs, painstakingly gathered by Jurgen Appelo. He looked at Google PageRank, Alexa traffic rankings, Technorati authority ratings, how many people link to the blog, commenting rate, and the RSSMicro FeedRank. In other words, an objective gathering of our collective subjective opinions of each other. While I have no clue how to measure any of those things, I can tell you I read 4 of his top ten and 11 of the top 100 at least once a week. If I were looking for more blogs to read, this list would include plenty of excellent candidates. Check it out! I like Scott Berkun's blog a lot. He often shares insightful glimpses of what it takes to achieve. In this entry, he talks about how ratsen fratsen hard it is to write a book. This reminds me that I don't want to write any more books (in case watching Julie finish hers wasn't reminder enough) and also connects to the trouble I sometimes have with other long term unstructured projects. Deciding to work on what needs to be worked on is how you show your character. Day in, day out. Don't like the character you're showing? Decide differently, starting today. Let me share with you something I heard on the TV the other night that really clicked with me. "As I get older," the man said, "I find that I ask myself questions more. You know, why am I here?". He paused, and I nodded. The older we get the more life we have to ponder the meaning of. Then continued. "It's not exactly philosophy though. It's more ... why am I here... in the basement? What the heck did I come down here for? " Oh yeah. That I do even more than the pondering. The WPF team have released an interesting document called the WPF Application Quality Guide. You can download it as a .doc file from that page, or just read it on line. It's an intruiging combination of handy links (Getting Started with WPF), overview diagrams, philosophy and advice around testing and development that would apply to non WPF projects as well, and very WPF-specific practices (should I derive from Control or UserControl?) aimed at testers and developers alike. The Word version runs to almost 80 pages but not all the sections will apply to every reader. You should take a look at it, for sure. I think it's a good point. If you know C++, now's a good time to use it. If you don't, then hang around (at least virtually) with those who do - we can point out some cool things. And thanks to the magic of interop, wrappers, and C++/CLI, perhaps we can make some of those cool things a little easier to get to from managed code. ... at the end of the day when you ask, “What did I build today?” The answer will be a troubling, “Nothing”. The days of fixing ten bugs before noon are gone. You’re no longer going to spend the bus ride home working on code; you’re going to be thinking hard about how to say something important to someone who doesn’t want to hear it. There will be drama. And there be those precious seconds when there is no one in your office wanting… something. If that resonates with you, read the whole thing. You'll be glad you did. I don't know why it's Oregon. 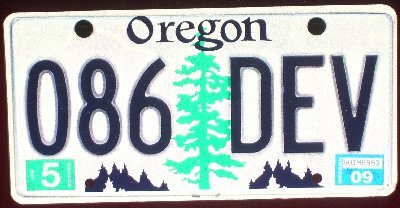 Probably all the Washington DEV plates are taken . When I first saw it, I said to myself "somewhere here there's a 22 year old developer who wishes this plate was available." It was several days before I remembered that Gregory Consulting was founded in 1986. Nice.